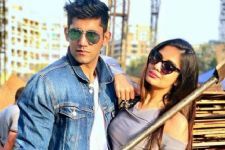 Zee TV show Guddan Tumse Na Ho Payega featuring Kanika Mann, Nishant Malkani, and Rehaan Roy is quite popular among viewers. The story revolves around a 20-year old who becomes India's youngest mother-in-law and how she fails at doing everything, yet keeps trying. The storyline is unique and fresh and people are loving the content. Well, Valentine is around the corner, in fact, the Valentine week has already started and every show has a romantic track going on (clearly love is in the air for everyone). 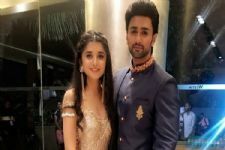 Guddan Tumse Na Ho Payega's cast is also geared up for a special Valentine special episode. 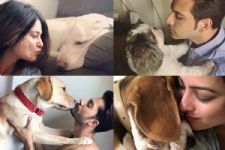 The cast has shot for a party sequence and actors Kanika Mann and Rehaan Roy have also shared some fun pictures from the shoot. Kanika Mann's look reminds us of Deepika Padukone's look from the song Badtameez Dil' from the movie Yeh Jawani Hai Dewaani. The same plain blue saree with a black shimmery blouse and hair kept loose in soft curls. Kanika carried off the look beautifully. Are you excited to watch the Valentine special episode? Let us know in the comment section below. All is not well between Priyank Sharma and Siddharth Sharma? Kanika Mann is doing fab as Guddan! Keep slaying the show as Guddan and Akshat in Guddan:Tumse Na Ho Payega! Nishant Malkani & Kanika Mann are Excellent in Guddan:Tumse Na Ho Payega! I am super excited Nishant Malkani & Kanika Mann are doing a fab job as our Akshan. Best wishes Team. Loving Akshan, their chemistry is awesome! Love Akshan & Guddan:Tumse Na Ho Payega. Guddan:Tumse Na Ho Payega. Guddan:Tumse Na Ho Payega. Love Akshan & Guddan:Tumse Na Ho Payega. Guddan:Tumse Na Ho Payega.